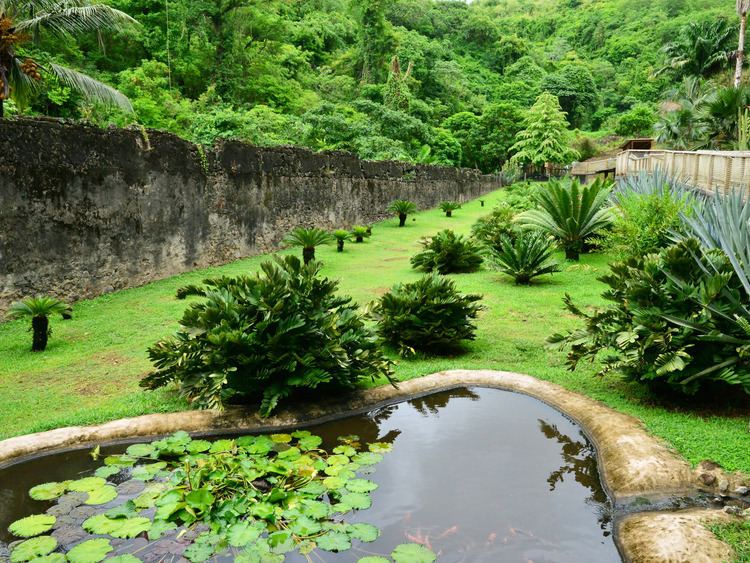 Come with us and visit this unique Botanical garden created among the ruins of one of if not the oldest plantation in the island “Habitation Anse Latouche totally destroyed on may 8th, 1902 by the volcano eruption. Heading west via the Caribbean Coast, you will pass along little fishing villages before your arrival to this unique Botanical garden created among the ruins of one of if not the oldest plantation in the island “Habitation Anse Latouche totally destroyed on may 8th, 1902 by the volcano eruption. In the enchanting setting, you can now discover the Martinique Zoo! Monkeys, jaguars, pumas, lorikeets, great anteater, raccoons ... and hundreds of others already present today or planned inhabit these places for your viewing pleasure. In the midst of the ruins of the house renovated Latouche, dated of 1643 that visitors can walk through a didactic trail to discover the animals and why not interact with them. The remains of the house Latouche, nestled in the valley reflect the economic activity of yesteryear in Martinique and its rich heritage. During your visit you will discover the main house and its charming colonial style, the old equipment workshops cassava, indigo, and of course sugar and rum.